Need to quick dress up your house before Company comes for the HOLIDAY's? Here is a quick and easy way! make your own Kitchen ART. I scored a bunch of Free old cupboard doors off of C.L. and I had no idea what I was gonna do with all of them. So I took 5 of them and thought...I will just prep them and take it from there. So I took off the hinges and handles filled the nail holes and then got out a couple different colors of my home made chalk paint. So I had blue and green and yellow cupboards drying in my driveway. So I went on over to THE GRAPHICS FAIRY, and started printing of some of my faves and mixing and matching some that I liked. when they were done, to keep the reuse effort going, I used some pop tabs as hangers. Here you can see all the different INSTANT ART I made for next to nothing. These turned out great. I've never done a freezer paper transfer. Will have to try it. Found you on Tip Junkie. Ok because you are so amazing!! as seen in the post.... I am giving you an award for your blog. It is called the Liebster Blogger Award As part of the tradition it is passed along to 5 bloggers that have motivated and inspired. To accept the award you must: 1. Link back to the person who gave it to you and thank them 2. Post the award to your blog 3. Give the award to 5 bloggers with less than 200 followers that you appreciate and value. 4. Leave a comment on the 5 blogs to let them know that they have been offered this award.As part of the tradition it is passed along to 5 bloggers that have motivated and inspired. Congratulations!!!! I'll send teh actual award to your email so you can post it. You are so deserving of this! These turned out great! Love repurposing and thrifty too! So clever! I love them, they would look so great in my dining room! Pinning it! Those doors look beautiful now! I love the French sewing one, as well as the Kitchen art. Lovely. I love every one of these! I'm with you, I think the French sewing one is my favorite. Beautiful work as usual! 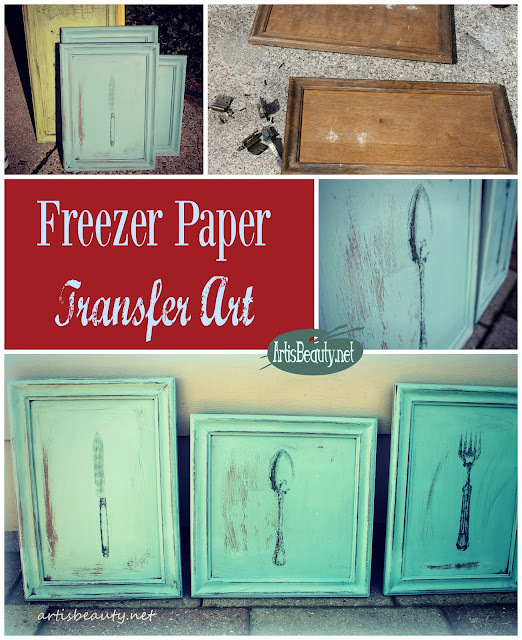 Every time I see one of your freezer paper transfer projects I want to give it a try. Alas, I have yet to do one yet. I hope you like stickers... because I am loving this. Thank you so much for sharing! I DO love stickers!!!! Thank you so much for the compliment! Really cool and clever! Great job! I would love if you stopped over to my Creative Inspirations party happening now to link up! I would love to have you there! Fab idea! I just finished a cupboard door project myself but never would of thought of this idea. Love them! I am featuring you tomorrow... Thank you so much for sharing your project over at my party! Love the different shapes and the distressed look! I would have never thought to use cabinet fronts for art! Very pretty, love the turquoise cutlery ones! Oh, how I love this project! This is a wonderful way to reuse cast-off materials. Your wall art is fantastic--and earth friendly! Oh my goodness... I NEED those for my kitchen...hehe! I LOVE them. You are so talented, and the fact that they are from recycled materials make them even that much better. Thank you for sharing this with us at Inspiration Friday! Those look great! Love the color! Thank you for linking up to A Pinteresting Party! :) Hope to see you again! This is a very common art that we often forget about. We do not think about the fact that simple doors have so much style and work put into them. In Calgary and throughout the world, we can see that the doors are very helpful to have. It is a necessity. You got a creative and unique door art! Bravo! Where can I find your homemade chalk paint recipe?